Model for a Marine Protected Area designed for sustainable Whale Watching Tourism off the oceanic Island of La Gomera, published by M.E.E.R. e.V., Author: Dipl.-Biol. Fabian Ritter, Berlin, Germany, 37 pp. This report has been produced on the basis of almost 15 years of cetacean research off the Canary Island of La Gomera (Canary Islands, Spain). A framework for a marine protected area in the waters off this island is laid out in the report. Furthermore it justifies – on the ground of what is known about cetacean biology and ecology off La Gomera – why a comprehensive concept is needed for marine conservation and how it should look like. Interactions of Cetaceans with Whale Watching Boats – Implications for the Management of Whale Watching Tourism. M.E.E.R. e.V., Berlin, Germany, 91 pp. 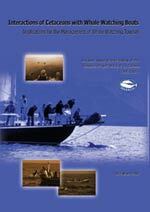 This report presents the results of the first six years of research conducted off La Gomera (Canary Islands), revealing cetacean abundance, distribution and their behavioural interactions with whale watching boats. As a central part, it also depicts a model of a marine protected area especially designed for the sutainable use of cetaceans off La Gomera. A PDF copy (15 MB) of the complete research report can be ordered via e-mail. Ritter, F., Steindorff, C., Sommer, C. & Smit, V. (2018). Observing Cetaceans from Land – Co-operation as the Driving Force behind Sustainable Whale Watching Tourism. Poster presented at the Annual Conference of the ECS, La Spezia, April 2018. Galletti Vernazzani B., Burkhardt-Holm P., E. Cabrera E., Iñíguez M., Luna F., Parsons E.C.M., Ritter F., Rodríguez-Fonseca J., Sironi M. & Stachowitsch M.(2017). Management and conservation at the International Whaling Commission: A dichotomy sandwiched within a shifting baseline. Marine Policy 83: 164–171. Ritter, F. & Bünte, J.N. (2016). Who is following whom? Interspecific associations between bottlenose dolphins and pilot whales in deep waters off La Gomera. Poster presented at the Annual Conference of the ECS, Madeira, Portugal, March 2016. Ritter, F. (2016). Collisions of Vessels with Cetaceans: How to Mitigate an Issue with Many Unknowns. In: Von Nordheim, N. & Wollny-Goerke, K. (Eds. ): Progress in Marine Conservation in Europe 2015. BfN Skripten 451, Bonn, Germany. ISBN 978-3-89624-188-7. Ritter, F., Kautek, G., Kelm, B. & Kelm, A. (2015). Detecting Dodgy Dolphins: Assessing Physical Anomalies in Small Cetaceans off La Gomera (Canary Islands, Spain). Poster presented at the Annual Conference of the ECS, Malta, März 2015. Smit, V. & Ziltener, A. (2014). 2nd workshop on „Communicating marine mammal science to the general public“. Report presented at the Annual Conference of the ECS, Liège, Belgium, April 2014. M Tobeña, A Escánez, Y Rodríguez, C López, F Ritter & N Aguilar (2014) Inter-island movements of common bottlenose dolphins Tursiops truncatus among the Canary Islands: online catalogues and implications for conservation and management. African Journal of Marine Science 2014: 1–5. Scheer, M. & Ritter, F. (2013). Underwater bow-radiated noise characteristics of three types of ferries: implications for vessel-whale collisions in the Canary Islands, Spain. Poster presented at the Annual Conference of the ECS, Setubal, Portugal, April 2013. Ritter, F. (2012). Collisions of sailing vessels with cetaceans worldwide: First insights into a seemingly growing problem. Journal of Cetacean Research and Management, 12(1): 119-127. Sollfrank, T. & Ritter, F. (2012). Watching Cetaceans from Land in the Canary Islands: Implications for the Management of Whale Watching. Poster presented at the Annual Conference of the ECS, Galway, Ireland, March 2012. Ritter, F., Ernert, A. & Smit, V. (2011): A long-term cetacean sighting data set from whale watching operations as a reflection of the environmental dynamics in a multi-species cetacean habitat. Poster presented at the Annual Conference of the ECS, Cadiz, Spain, March 2011. Carrillo, M. & F. Ritter. (2010): Increasing numbers of ship strikes in the Canary Islands: Proposals for immediate action to reduce risk of vessel-whale collisions. Journal of Cetacean Research and Management 11(2):131-138. Ritter, F. (2010): Quantification of ferry traffic in the Canary Islands (Spain) and its implications for collisions with cetaceans. Journal of Cetacean Research and Management 11(2):139-146. Smit, V., Ritter, F., Ernert, A. & Strüh, N. (2010): Habitat partitioning by cetaceans in a multi-species ecosystem around the oceanic island of La Gomera (Canary Islands). Poster presented at the Annual Conference of the ECS, Stralsund, Germany, March 2010. Ritter, F. (2010): Short description of a near miss event involving a large vessel and humpback whales (Megaptera novaeangliae) off Antarctica. Poster presented at the Annual Conference of the ECS, Stralsund, Germany, March 2010. Ritter, F. (1996) Abundance, Distribution and Behaviour of Cetaceans off La Gomera (Canary Islands) and Their Interaction with Whale Watching-Boats and Swimmers. Diploma Thesis to the University of Bremen, Faculty of Biology. 114pp. Parsons, E.C.M., Fortuna, C.M., Ritter, F., Rose, N.A., Simmonds, M.P., Weinrich, M., Williams, R. & Panigada, S. (2006): GLOSSARY OF WHALE WATCHING TERMS. Journal of Research & Management 8 (suppl. ), 249-251. SHIP STRIKES IN THE CANARY ISLANDS: THE NEED FOR URGENT ACTION TO MITIGATE COLLISION RISK. Collisions of Vessels with Cetaceans. Building the ground for whale watching management: Lessons from a „best practice“ perspective at La Gomera, Canary Islands. Problems with Fast Ferries in the Canary Islands. Whale Watching Research off La Gomera (Canary Islands). What can whale watching do for conservation? M.E.E.R. La Gomera: An Example from the Canary Islands. Whale Watching and Research on La Gomera (Canary Islands). Draft prepared for the Workshop on Whale Watching & Research at the WMMSC in Monaco, 19. January 1998. By Dipl.-Biol. Fabian Ritter. 5pp. 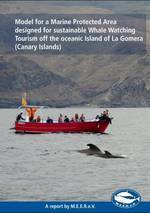 Interactions of Cetaceans with Whale Watching Boats off La Gomera (Canary Islands). Outline of the research of the project M.E.E.R. La Gomera. By Dipl.-Biol. Fabian Ritter. 8pp. Oldenburg, Lisa (2014). Whale Watching Tourismus auf den Kanarischen Inseln – die Rolle von nachhaltigem Tourismus bei der Entwicklung eines neuen Nischen Marktes. Bachelorarbeit, Fachhochschule Stralsund, Studiengang Freizeit- und Tourismus Management. Heuer, Lisann (2013). Darstellung von Sichtungsdaten von Walen und Delfinen vor La Gomera mithilfe eines Geographischen Informationssystems (GIS). Bachelorarbeit, Hochschule für Technik und Wirtschaft Berlin – HTW Berlin, Studiengang Betriebliche Umweltinformatik, Juni 2013. 64 Seiten. Strüh, Nina (2008): Abundanz und Verbreitung von Cetaceen vor La Gomera im Zusammenhang mit Oberflächenwassertemperatur und Chlorophyllgehalt. Diplomarbeit, Universität Marbrug, Fachbereich Biologie, Zoologie. 81 Seiten + Anhang. Koch, Katrin (2007): Untersuchung über Verbreitung und Vorkommen von Cetaceen vor La Gomera anhand eines Geografischen Informationssystems (ArcGIS). Diplomarbeit, Freie Universität Berlin, Fachbereich Biologie. 44 Seiten + Anhang. Kiesewetter, Wolf (2007): Die Qualität von Naturerfahrungen am Beispiel von Whale Watching auf La Gomera/Kanarische Inseln. Diplomarbeit, Fachhochschule Eberswalde, Fachbereich Landschaftsnutzung und Naturschutz. 78 Seiten + Anhänge. Weisenberger, Frank (2005): Grundlagen eines Meeressäuger-Informationszentrums für ein nachhaltiges Whale Watching vor La Gomera (Kanarische Inseln). Diplomarbeit, Universität Trier, Fachbereich Geowissenschaften / Fremdenverkehrsgeografie. 124pp + Anhänge. Gonçalves, Francisco G. F. F. (2003): THE EFFECT OF ENVIRONMENTAL AND ANTHROPOGENIC FACTORS ON THE ABUNDANCE AND DISTRIBUTION OF CETACEANS OFF LA GOMERA (CANARY ISLANDS). University of Glamorgan, School of Applied Sciences. 84pp.